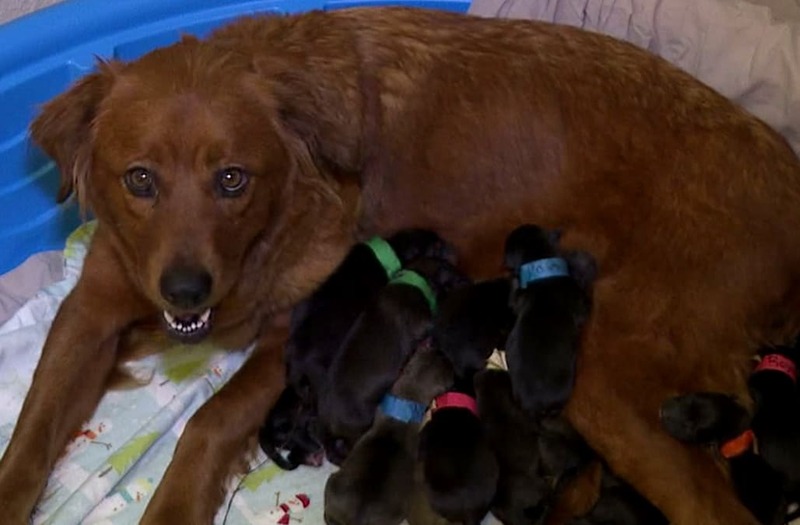 A Missouri woman got the surprise of a lifetime after she saved a pregnant dog on the euthanasia list from her local pet shelter -- and it gave birth to 18 puppies! Mom Ashlee Holland adopted mom-to-be Ava, a golden retriever-chow mix believed to between two and four years old, from Midwest Animal ResQ in Raytown, Missouri. "She was on the euthanasia list. She had no other choice, no other hope. I was basically her last resort along with Midwest Animal ResQ," Holland told WDAF. "No dog deserves to be put to sleep for space." Although Holland was aware that her new rescue pet was pregnant at the time of the adoption, she didn't know quite what she was getting herself into. "I was aware she was having puppies, but X-rays didn't show how many," Holland told the station. Ava went into labor on June 25 and her first puppy was born at 10:02 p.m. The momma dog went on to have another four puppies within 57 minutes, according to Holland. "She took a little break, had puppy #6, another break and then puppy #7 at 12:33 a.m.," Holland wrote on Facebook. "All signs showed that she was done having puppies as she had calmed down, wasn't having anymore contractions, and was caring for her 7 new babies." "Ava got cleaned up and taken care of and her bedding was changed and we called it a night, only to wake up to 8 more puppies!!! We were now at 15!" she wrote. "I had to tend to my kids and get them ready for summer school and came back to find out she had given birth to another 3 pups!" In total, Ava gave birth to 18 healthy and adorable puppies, all of which Holland's 9-year-old son named after Kansas City Royals players. "We got Ned Yost, Dayton Moore, Buck O'Neil. We got Esky, Royal," she said. "It's heaven. Puppy pile, you can't get any better than that." Holland told WDAF that rescuing animals has always been a passion of her's and that this entire experience has simply left her over the moon. "It's overwhelming. It's incredible. I didn't just save one life, I saved 19," Holland said. "It's amazing." Holland said Ava and her puppies will be ready for adoption in approximately eight weeks, pending medical examinations. Anyone interested in either adopting a puppy or helping Holland care for them can click here.